A few weeks ago, back in December 2015, I came up with an idea for an art program for the teen summer reading program: an exercise in color from the book, Local Color by Mimi Robinson. Robinson based her idea on the works of Josef Albers, a German artist who spend years studying how the mood of a painting changed based on color combinations. I read the library’s copy of An Eye for Color to learn a little bit more about the life of Albers. So, I was totally blown away when, while in Boston (January 8-11, 2016) for ALA’s Midwinter meeting my friend Madeline and I snuck away from the excitement to visit the Institute of Contemporary Art (ICA). To my utter astonishment the exhibit at the ICA was on Black Mountain College (1938-1957) where Josef Albers taught from 1933-1949! On display were some of his work! I was so inspired and excited that I I couldn’t stop talking. (Poor Madeline). 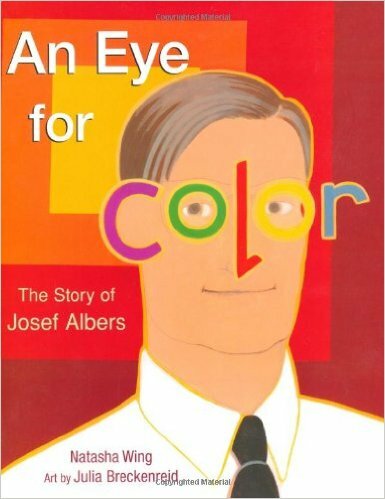 An Eye for Color is a fantastic picture book biography about the life of Josef Albers. Born in Germany in 1888, Albers saw art in the simplest things. He would start out being a primary school teacher, an art teacher, and then in 1920 Albers attended the German art school, Bauhaus. The Bauhaus philosophy was that art, technology, and business should be brought together to apply good design to industrial objects, such as buildings and furniture. In 1933, with the rise of Nazi Germany, Albers was asked to teach at the Black Mountain College located in Asheville, North Carolina. Albers would teach at the experimental college until 1949 when he was made head of the design department at Yale University. It was while teaching at Yale that Albers started his study of color. Wing’s simple text is partnered with Breckenreid’s illustrations that gives readers the visual elements to fully understand Albers’ work with color. 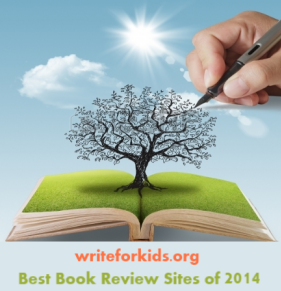 Wing offers an author’s note that reveals Albers was her neighbor while growing up. Unaware of his fame, the young Wing eagerly shared her school art projects with the world famous artist. It would be as an adult that Wing realized the magnitude of the influence the kindly gentleman wearing a long overcoat and a beret had on the world of art. Back matter, besides the author's notes, include a glossary of basic color theory, bibliography, and a see for yourself activities that would be perfect to do with a classroom or by yourself. This book can be read as a simple story about an interesting man who loved color or if reading to an older audience, read the author’s note first. It will greatly enhance the readers understanding of Josef Albers and his work. 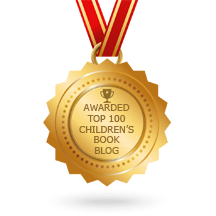 A thoroughly engaging and inspiring picture book biography. Thank you so much for this kind review! I'm glad you stumbled upon his art as well. It looks so simple, but in person it's impactful. I look at color in a totally different way since writing about Josef Albers. Please pass the book on to your art friends!